The daunting task of combing through David Bowie’s catalog of top shelf songs to arrive at a setlist for the upcoming Celebrating David Bowie tour mainly falls on the ears and shoulders of longtime Bowie keyboardist Mike Garson. Widely acknowledged as Bowie’s longest and most frequent band member, Garson had a piano stool view of Bowie’s mastery of the stage during the more than 1,000 concerts around the globe he was privileged to be a part of. David Bowie’s 1973 album Aladdin Sane begins with the song “Watch That Man.” For decades, Garson had the best seat in the house to do just that – watch that masterful, mystical, musical man David Bowie ply his stagecraft in every corner of the globe. 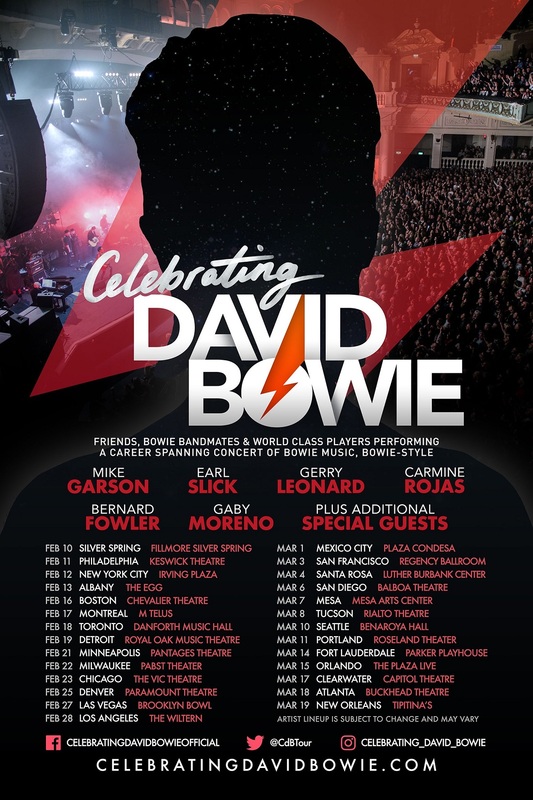 Today, Garson and a group of fellow former Bowie band members are gearing up to hit the road to pay tribute to their late “Starman” on the 27-stop Celebrating David Bowie tour, which launches February 10th in Silver Springs, Maryland and touches down March 19th in New Orleans. I recently spoke with Garson about the upcoming tour, the collection of out-of-this-world musicians who will join him onstage and the otherworldly essence of what makes David Bowie’s music timeless on this or any other planet. Fine, Jim. Are we live or are we just taping? We are on tape. It’s a pleasure to talk to you today. Before we jump into taking about the forthcoming Celebrating David Bowie tour, would you please give us some basic background on your relationship – on and off the stage – with David. When and how did you two first meet? We met in 1972 in New York. I’d played on an album by an avant-garde singer named Annette Peacock, and she new David Bowie and (guitarist) Mick Ronson. They came from England over to the States to do the first American Ziggy Stardust tour. They needed a pianist and she recommended me. They asked me to come down and audition, and I didn’t know who David was, but it was intriguing to me. I sat down at the piano, and Mick Ronson was there and David Bowie was in the control room with the rest of the Spiders from Mars. I played about eight-to ten seconds and he said, “You have the gig.” And that was it. He had me play the song “Changes.” I was hired for eight weeks. They couldn’t get rid of me and I turned out to be the longest-standing member. I probably did ten-to-20 albums and over 1,000 concerts. So, music aside, what was David’s finest quality offstage and out of the studio? I think his sense of humor and his intellect. Thankfully, I can attest to that. 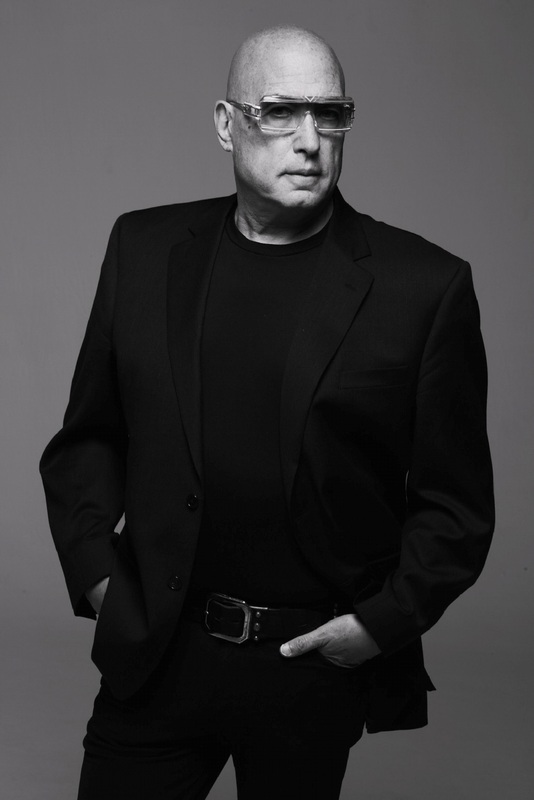 I produced the nationally syndicated show Rockline for several years in the mid-90s and I had the pleasure of having David on at least a couple of times. We all get the question from friends and family members, “Who was the coolest or nicest rock star you ever worked with,” and I often put David Bowie at or near the top because to me he was just such a gentleman. You’re exactly right! Look how long he lasted in so many fields and areas, and it’s deserved. His talent was enormous. His creativity was even greater. He was always dreaming and never resting on his laurels. He was not a complacent person at all. Had he not passed, we would of continued and done another album called Outside: Part 2 with (producer) Brian Eno. We talked about that. Oh, wow, that’s great. Let’s talk about some of the other players you’ll be sharing the stage with on the North American leg of this tour, which gets underway February 10th. Let’s start with Adrian Belew. What is it about his playing do you think David was drawn to? He’s like a mad scientist. He’s just extremely creative with his sounds. And this guy also has a great voice. By the way, he was on the European leg of the tour. He won’t be on the American leg. There seemed to have been a scheduling problem or a misunderstanding. We have quite a roster for the upcoming tour, and we’ll be bringing in different guests in each area, each city to sit in with us. Great, thank you. I appreciate the clarification on that. One of the band members I wanted to mention is (bassist) Carmine Rojas, who going back to my days in Los Angeles, I’m honored to say I was pretty close to in the late 90s when I was the music director and KLOS. He’s known for his long stints with David and Rod Stewart – another personal favorite of mine – and the great guitarist Joe Bonamassa. What makes Carmine such a standout? Well, both him and I come from Brooklyn, so that’s a good start. Tony Visconti, David’s old producer, was from Brooklyn. He seemed to like people from Brooklyn. Tell us who’ll be tackling the unenviable task of singing some of David’s most beloved songs. Who will you have on vocals? We have Gaby Moreno, who was with us (in 2016) on the Celebrating David Bowie tour. She’s from Guatemala and she’s a powerhouse. She sang “Five Years” and “Rock ‘n’ Roll Suicide.” It was really impressive. So, we have her and (singer) Angelo Moore from Fishbone, and numerous amounts of artists that I’ve been talking to that we’re keeping as surprises that will show up. So, will you guys be staying true to the original arrangements, or will you take some liberties – mix things up? Well, you know, the thing about David – and trying to do it through his eyes – is he gave the people the music they loved. And we will play those songs like “Let’s Dance” and “Fame” and “Life on Mars” and “Changes” and “Heroes” and “Under Pressure.” We’ll do some esoteric ones, too. There are just some pieces that are wonderful that need to be exposed. I was always sort of the loose cannon in the band, where he allowed me to improvise on the piano. So, I will be faithful to the music, but I’ll also continually experiment and be searching for new things. As I understand it, Mike, I guess you could call it the mantra going into this tour – the theme – is, what might a David Bowie 2018 tour setlist consist of. You gave us a hint at some of the things that fans will be able to expect (to hear). Gosh, how tough was it to get to that setlist? You know, right now I have over 40 songs in the set, and that’s with hundreds, so even getting it down to 40 was hard, and probably each show we might do 20-some odd songs and as we move from city-to-city, take one song out, put another song in. That kind of a thing. Because the last thing you wanna do is – and David used to talk about this also – is, you don’t wanna get bored and you wanna keep yourself fresh. So, we’ll probably rehearse 40 songs and then, I don’t know, a show anywhere from 22 to 26 songs, I would say. I think you answered what was going to be my next question, which was, was there some sort of common thread or sense of musical direction that you were trying to follow when putting the setlist together. But, I guess it’s fair to say that the answer might be “no,” in the sense that the palette was wide. He has so much music. I was looking at some of the songs he’s written and it’s incredible. We know “Space Oddity” and we know “Life On Mars,” but he has songs like “The Motel” and “Strangers When We Meet” and “Thursday’s Child” and “Quicksand.” He had these pieces that people need to hear. But I don’t wanna make it so esoteric that people can’t connect to a song, so I’m gonna maybe have four or five of those more esoteric ones. So, I’m gonna be respectful to those. Final question for you, Mike, and again thank you for your time today. I appreciate it very much. Final question, and it’s a hard one. Let me preface it by saying that. Which is your favorite David Bowie song? You know it changes every few weeks (laughs). Let’s see what it’s been this week, because I keep going through the music. I love “Lady Grinning Soul.” I love the title track to Aladdin Sane. I love “Time.” I love “Space Oddity.” I love “Quicksand.” I love “The Motel.” I like “Strangers When We Meet.” It’s just endless. “Absolute Beginners.” Generally, “Life on Mars” and “Aladdin Sane” and “Lady Grinning Soul” and “Space Oddity” seem to always be at the very top. But that’s because I played them so many times, and that’s what you hear all the time on the radio. Of course I love “Let’s Dance” and “Fame.” Those are just fun pieces to play. The guy was a renaissance man. He wasn’t just a rock star. He was so much bigger than rock and roll. He was an editor of an art magazine. Very sophisticated art. Nothing to do with music and he was the editor of that. The guy did sculptures. I was doing an album with him in the 90s and he had an easel set up as I’m playing the piano and he was doing charcoals of my face. The guy was a remarkable actor, but he wanted to stay out of L.A., so we don’t know too many films by him, but there are certainly a few that are just unbelievable. And a songwriter. And a producer. He was my favorite producer of all the producers I’ve worked for because he gave me the most space. He gave me a vision, but then he allowed me to do what I heard. He never micro-managed me, and a lot of producers micro-manage and its very frustrating. He was great. I miss him every day, and like I said, we would have done some more touring. He was talking about it with Brian Eno. I feel the loss, but by playing this music I still feel connected to him. Do you know what I mean? Yes, absolutely. He gave us all the sound and vision. He is one of our great composers. His music touches people in a very deep way. He had a grace, a beauty that you get maybe five in every generation. You think of Dylan, you think of the Beatles, you think of the Rolling Stones, you think of Bono. Mike, thank you again. Take care, bye-bye. An Interview With The Singer-Songwriter, MARTY SHANNON, On New Music, Favorite Artists and More! An Interview With THE REVEREND SHAWN AMOS On His Forthcoming Album, ‘The Revered Shawn Amos Breaks It Down’ and More! 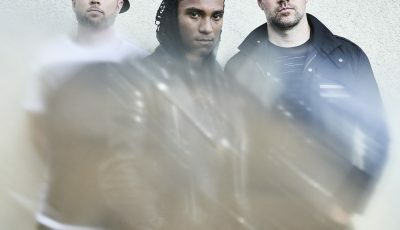 An Interview With The LA-Based Power Rock Trio REBEL RAMPAGE About New Music and The New Year Ahead!